Texas Betony is a member of the Mint Family. The plant grows to a height of 3 feet and has dark green oval to triangular leaves with toothed edges and a deeply ridged surface to 3 inches in length. The plant typically grows on slopes and in canyons at elevations between 1500 - 8000 feet. 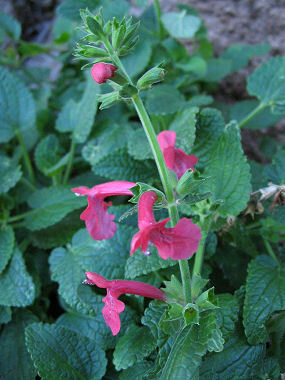 Texas Betony is also known as scarlet sage and scarlet hedge nettle. Texas Betony blooms between March - October and produces red to reddish pink, tubular flowers to 1.25 inches in length with two lips, the lower of which has 3 lobes and protrudes downwards.